We all remember the famous McDonald’s hot coffee case where Stella Liebeck sued McDonald’s after her scalding coffee spilled and burned her. But do we know the actual facts? Jason Hartman interviews Susan Saladoff, former attorney and producer of the documentary “Hot Coffee,” regarding the distorted facts surrounding the case and what is wrong with our court system today. For more details, listen at: www.HolisticSurvival.com. Susan purports that our justice system has become partial to big business through public relations campaigns, and people believe that we have an out-of-control court system where anyone can sue for any frivolous reason, which has resulted in tort reforms – or tort “deforms” as Susan describes it. Susan says it is actually very difficult for a person with a non-meritorious case to win any money or even find a lawyer to defend them. She also says that people tend to think that many civil suits are ridiculous and are brought about by greedy people and businesses until it happens to them. Large corporate interests have this belief that if they can convince the public that the system is broken, that there are too many frivolous lawsuits, people will vote against their own best interests for tort reform. In doing so, we forfeit our Seventh Amendment right to access the court system. Jason and Susan discuss arbitration consequences, the corruption of the legal system, and what people can do to protect their rights. Susan Saladoff (Producer, Director) spent twenty-five years practicing law in the civil justice system, representing injured victims of individual and corporate negligence. She stopped practicing law in 2009 to make the documentary, HOT COFFEE, her first feature-length film. She began her career as a public interest lawyer with the law firm of Trial Lawyers for Public Justice, now known as Public Justice, an organization that, for the last 25 years, has been at the forefront of keeping Americas courthouse doors open to all. Susan was recognized by her peers as an Oregon Super Lawyer for five consecutive years from 2006 to 2010. She is a graduate of Cornell University and George Washington University Law School, and has frequently lectured at the state and national levels on the importance of the civil justice system. Narrator: Now you can get Jason’s Creating Wealth in Today’s Economy home study course. All the knowledge and education revealed in a 9 hour day of the Creating Wealth Boot Camp. Created in a home study course for you to dive into at your convenience. For more details go to JasonHartman.com. Jason Hartman: My pleasure to welcome Susan Saladoff to the show. She is the producer and director of a documentary I recently saw and would highly recommend entitled Hot Coffee. And several years ago we had a lawyer come and speak at our office and he opened his speech talking about the Stella Awards. And Stella is the person that you have certainly heard of in the news media who spilled the coffee on herself from McDonalds, and it’s a very famous, and frankly until I saw Susan’s documentary, a rather maligned image you may have of Stella. So let’s kind of straighten those perceptions out and dive into our legal system, and how we can all be better protected from issues that arise in our legal system as well. Susan, how are you? Susan Saladoff: I’m great. Thank you for having me on your show. Jason Hartman: Well, good. Thanks for joining us. Great job on Hot Coffee. What is your background and what inspired you to produce the documentary? Susan Saladoff: I practiced law for 25 years, and I knew through my practice that most people didn’t understand the importance or even care about the civil justice system until it affected them personally. And then when they tried to access the system, they realized for the first time the misinformation that they had been fed over the years to believe that the system is broken, and that there are too many frivolous lawsuits. Jack pot justice, law suit lottery, all these terms that were really market tested to convince people of something that really is important, it’s their constitutional right to access the court system. Jason Hartman: Towards the end of your documentary, and I can’t remember who it was, but someone made a great quote about our legal system and how it was something to the effect of, and maybe you can remember it, something to the effect of how when one person asserts their rights and then files a lawsuit to do so, they are potentially helping hundreds if not thousands of other people. Do you remember that quote? It was an excellent quote. Susan Saladoff: Yeah, it’s actually the very last sentence of the whole film. Essentially that Stella was a hero because when you bring a lawsuit, you’re not just bringing it for yourself; you’re bringing it for other people. Because when you bring a lawsuit and you hold wrong doers accountable, particularly when wrongdoers make products that are harmful to us, then you cause them to have to take responsibility for what they’ve done and often times they will change their behavior so that they’re not held accountable to others. It really comes down to dollars and cents unfortunately, because most corporations aren’t going to change their behavior unless it affects them in their pocketbook. Jason Hartman: Of course, of course. When you mentioned earlier about jackpot justice and so forth, you’re not saying that there are no frivolous cases and there’s no jack pot justice, where it’s been unfair to the defendant, right? Certainly people in business complain about lawyers and liability and how it increases the cost of running their business, and complain constantly, and I’ve done it myself. I’ve been in business for many years, about how you have to tiptoe around and walk on eggshells and be careful. But some degree of this is a good thing. It’s not all bad, right? Susan Saladoff: Well, I want to take umbrance with you because what’s frivolous to you may not be frivolous to someone else and vice versa. I’m assuming that before you saw my film, that you just assumed that the McDonalds coffee case was a frivolous lawsuit. Jason Hartman: I did, I did. Susan Saladoff: And if I asked you now, would you still think that? Jason Hartman: No I don’t think that because in your film, you really dissected the issues of that case. And I think most people think it’s frivolous, and I had no idea how McDonalds mounted this public relations campaign to marginalize Stella and marginalize what happened. Susan Saladoff: So it wasn’t really McDonalds as much as it was these tort reform groups. There groups that were set up by large corporations to manipulate public opinion, and really started by the tobacco industry. Because the tobacco industry, as your listeners knows, makes a product that kills people. And they were being held accountable for the first time in our court system. So these groups that are now champion by the US Chamber of Commerce, which of course has nothing to do with the government, and everybody thinks that they have something to do with the government because they’re the US Chamber of Commerce. But these groups are set up and they’re membership groups by large corporations, to have this massive public relations campaign and feeding information to the public through radio ads, television ads, and print ads, making them think one thing about our civil justice system, that’s very different from the truth. Jason Hartman: So Susan, people complain about frivolous lawsuits all the time. These people say that it makes their cost of doing business more expensive, they saw all the lawyers are just profiteering from it. Are there frivolous cases or are you saying that really no cases are frivolous? There’s always two sides to every story, right? Susan Saladoff: It’s so interesting when people talk about frivolous lawsuits, because it’s become almost like a term of art that people spew out very easily. It is very difficult for someone who has a non- meritorious case to ever win money in our civil justice system. And it’s even more difficult for person who has a non-meritorious case to get a lawyer. Because lawyers who represent these people only make money if they win the case. And they’re not going to be bringing lawsuits that are non-meritorious where they’re going to be spending a lot of their own money and years of work, and not win any money. We cannot prevent individuals from bringing cases on their own without a lawyer, but there are so many checks and balances in the system as it exists. For one, the person has to find a lawyer to represent them. And then if they do, the judge will throw out a non-meritorious case and even fine a person who has a so called frivolous lawsuit. And if it gets past the judge, he’s got twelve people sitting on a jury who are going to be evaluating the case, after hearing both sides of the issue and then rendering a verdict. It’s unlikely that they’re going to give a verdict or money to someone who has a frivolous lawsuit. And even if the jury makes a mistake, the judge can reduce it, like he did in the McDonalds Coffee Case, and then there are appeals and after appeal. So there are potentially cases out there that are so called frivolous, but they’re not going to get very far. What tends to happen is that businesses bring a lot of cases against businesses, and many of those do nto have merit. But in terms of personal injury cases, the myth that your listeners have heard, and based on the question that you asked me, is one that has been repeated often enough that people actually believe it’s true. Jason Hartman: Well, when it comes to the Stella case, this is such a cause celeb. The case has just been so talked about. What really happened? I know what happened now, because I watched your documentary Hot Coffee, but I think most people believe that this case was just ridiculous, but what happened? Susan Saladoff: So most people think that this crazy woman was driving the car and she spilled coffee on herself and she wasn’t severely burned, and she got millions of dollars. That’s sort of the myth that’s been perpetuated. In fact, what’s even ironic about that is that Jane Pauley, who was substituting for Tom Brokaw on the NBC Nightly News, the night that the verdict came out reported it to the world inaccurately that she was driving the car. The truth is that Stella Liebeck was 79 years old. She had never brought a lawsuit a day in her life. She was a passenger in a parked car. Her grandson was driving the car, they pulled up to a McDonalds, in Albuquerque, New Mexico, she ordered a cup of coffee through the drive through, she asked for cream and sugar, they put it in the bag instead of in the coffee itself, her grandson moved into a parking spot and parked the car. It was one of those old fashioned Styrofoam cups; not the kind of cups we have today. It was that small sort of flimsy cup with the little plastic top that had that little triangular thing that nobody could ever open. There were no cup holders or flat surfaces in the car, so she steadied the cup between her knees and onto the seat and tried to open it and couldn’t. so she pulled the lid off and the coffee was so hot that the cup literally collapsed and the coffee pooled in her crotch. The coffee was 180, to 190 degrees Fahrenheit. 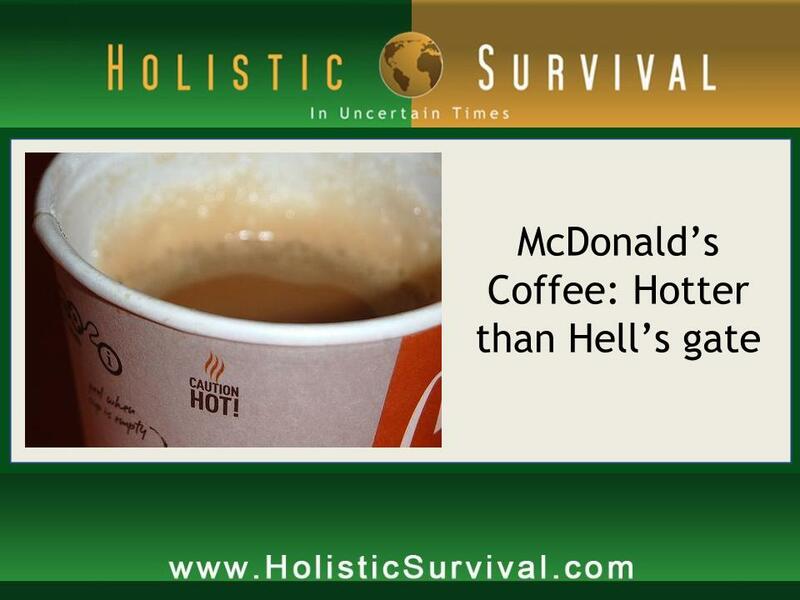 And the reason we know that, is because McDonalds had a policy to hold its coffee at that temperature. What’s so crazy about that temperature is that the quality assurance representative for McDonalds testified at the trial that you cannot drink coffee at that temperature because you will get burned. Jason Hartman: And what temperature, just for reference, what temperature should coffee be? Jason Hartman: Folks, if you have not seen the photographs, regardless of what you might think of this case, see the photographs and you may change your opinion of it. Susan Saladoff: And then, so she was in the hospital for eight days, had skin graphing and surgery, she was incapacitated for almost two years and all she asked for from McDonalds was the difference between what her medical bills were and what Medicare paid, and McDonalds offered her $800, never offered her another penny. And the jury, which of course people think oh they gave her millions of dollars, how crazy, the jury gave her, with a unanimous jury, twelve people all agreed, they gave her two days of coffee sales from McDonalds, which did come out to 2.7 million dollars, but then the judge reduced the verdict to $480,000. And then McDonalds appealed, and they wound up settling for an undisclosed amount of money. I don’t know how much it is, but I think it was actually even less than that. And then she was subject to a gag order, so she was unable to say what the truth was and what happened, and McDonalds wasn’t . And those are the true facts of that case. Jason Hartman: So she agreed to the gag order as part of the settlement, right? Susan Saladoff: You have to. When you settle these cases, every plaintiff is required to sign what they call a confidentiality agreement or they don’t agree to settle. Jason Hartman: But in this case, you can come along and make a documentary; other people can tell Stella’s story, right? Susan Saladoff: Right, but I could not tell you what she ended up settling the case for. I don’t know the answer to that. Susan Saladoff: Let me finish the story for you. That story never happened. They make up these cases. The Stella Awards go to Snopes.com. Not one of them is accurate. They’ve been repeating them over and over again for 20 some years. They recycle the same cases and say oh these are from this year. Jason Hartman: Urban legends. How amazing. Go ahead. Susan Saladoff: Well I’m just saying that you have to remember what’s happening from a political point of view and why the US Chamber of Commerce and the Institute for Legal Reform, which is their sort of tort reform arm, why they want to get these messages out. So they have this belief system, and when I’m saying they, I’m talking about large corporate interests, they have this belief system that if they can convince the public that the system is broken, that there are too many frivolous lawsuits to all of these things that we’ve been talking about, that people would be willing to vote against their own self-interest essentially. That they would be willing to vote for candidates who are pro tort reform, when as you can tell from the film, most people don’t even know what a tort is, let alone know what tort reform is, and yet they’re being asked to vote on it, they’re being asked to have opinions about it and many people do have opinions about it without really understanding that tort reform means average folks, you and I, we give up our constitutional rights, our seventh amendment, our constitutional right to access the court system, so that corporations can make more money. Because if we cannot hold them accountable in the court system, which is the only place where we can hold wrongdoers accountable, then they get to make more money. Jason Hartman: Well, fortunately nowadays, there is such an uprising of these customer complaint sites, and consumer complaint websites, that you can hold them accountable to some degree in the court of public opinion. But you’re not going to get money for it. You’re not going to get your damages recovered, right? Jason Hartman: Through arbitration, right. Very good point. I’m so glad you brought that up. I think arbitration, maybe it has its place, but in my personal experience I think it’s a bit of a scam because it’s not part of the public record and one of the big things that the original intent of our founders believed in, was that things should be public. The court should be open. You have a jury of your peers, you have openness and transparency in the system, and arbitration is covert. It’s a private court. And guess what, the arbitrators; they’re not getting repeat business from plaintiffs. They’re getting repeat business from businesses who put these arbitration in their contracts. AAA, the American Arbitration Association, supposedly it’s a nonprofit organization, yet it’s extremely expensive. Maybe you can speak to that a little bit. Susan Saladoff: So let’s first make a distinction if we could between voluntary arbitration and mandatory arbitration. Jason Hartman: Fair enough. Good distinction. Susan Saladoff: So, if for example, you have a dispute with somebody, a company or anybody. And you choose together, both sides agree, to come out of the court system and go into a system where you basically find someone who’s willing to listen to your case and then come up with a decision outside of the court system, there’s nothing wrong with that. Go for it. What I’m arguing against are these what are called, mandatory or forced arbitration clauses that are in the fine print of almost all of our contracts. Jason Hartman: You go to any doctor, any dentist, you’re going to be signing away your rights. And agreeing to arbitration, right? Susan Saladoff: Exactly. And you can’t even get into an emergency room in Florida these days without signing a consent form that has an arbitration clause in it. You cannot buy anything over the internet, without now, they have that scroll down thing and you have to then check I Agree. Jason Hartman: The thing nobody reads, yeah. Susan Saladoff: Nobody reads it because you can’t buy the product if you don’t say I Agree. And so these are in our mortgage contracts, in our real estate contracts, in our employment contracts. And they’re embedding in the fine print, nobody reads it, and when they do, even if they were to read it, they wouldn’t understand what they’re reading. And what these arbitration clauses mean is that if you even wind up having to dispute with this company, the company picks the decision maker, pays for the decision maker, the decision maker doesn’t have to give a reason why he or she comes up with the decision, it’s completely secretive and there’s no right to appeal. So guess who wins? The consumer never wins. And these are everywhere now. So people need to understand that these clauses exist, that they can cross them out sometimes and put their initials, but in most cases we cant. And so there is a bill pending before the house and the senate called the arbitration fairness act. And I would encourage you to contact your congress person or your senator to support that act. Jason Hartman: And one thing I think the listeners should know. Being in business, I’ve had a little bit of experience with this from time to time. They commonly say that well, arbitration is less expensive. It’ll reduce the cost, it’ll make it faster, streamline the process, etcetera. And that pitch really isn’t necessarily true either. You still have lawyers involved, we all pay taxes to have a court system, yet now when we’re agreeing to arbitration or not even having the choice whether we’re going to agree, forced arbitration rather than consensual arbitration, we’re having to pay a private court system. Isn’t that what I pay taxes for, to have access to a court system? Susan Saladoff: Exactly. And again there’s no guarantee that you will get justice in that system and there are no checks and balances in that system. Jason Hartman: And there’s usually no appeal whatsoever. Susan Saladoff: No appeal. And it’s completely secretive. And the one that makes me crazy is that the decision maker doesn’t even have to give a reason why he or she comes up with the decision. They just go you win, you lose and that’s it. You’re done. Jason Hartman: And oddly enough, an arbitrator may have or an arbitration company may actually have the motivation and incentive to prolong the case, because they charge by the hour, rather than court system that wants to dispose of cases because they’re usually over worked and over impacted. So it’s kind of counter intuitive sometimes. People think this will be the less expensive alternative, but it might be the most expensive alternative. Let me take a brief pause; we’ll be back in just a minute. Narrator: What’s great about the shows you’ll find on JasonHartman.com is that if you want to learn more about investing and real estate in different markets, there’s a show for that. If you want to learn 17 ways rich people think and act differently, there’s a show for that. If you want to know how to get paid to borrow, there’s a show for that. And if you’d like to know why Amsterdam doesn’t take dollars or why pools are for fools, there are even shows for that. Yep, there’s a show for just about anything, only from JasonHartman.com. Or type in Jason Hartman in the iTunes store. Jason Hartman: What can people do? Most people don’t pay attention to this stuff because they may only have a once in a life time event or a few times in a life time event where it really matters to them where their own health and wellbeing, if it’s in the case of a medical issue where they need money to pay medical bills, or their own financial wellbeing is impacted. What can people do Susan? Susan Saladoff: So we have on our website, we have a take action page and we have four exhibits in the film which are really four different ways that we as Americans are giving up our rights to access the court system. And most of us as you know don’t have any idea or even care until it affects us personally. Each of those sections of the film, one is called The Public Relations Campaign; how we’re being fed information, false information often times, by these public relations campaigns through front groups. They’re not even, because of the citizen’s united case, which is the Supreme Court case that says that corporations can give unlimited amounts of money to campaigns without even disclosing where the money is coming from. And so what happens is they never say oh this is the US Chamber of Commerce or this is Pfizer Corporation finding this. It says citizens for a stronger for a stronger community or citizens for a safer environment. They make up these front groups and then they put television commercials on the air or print ads and it says citizens for a stronger community and nobody knows who’s behind it. So the first thing that we have to do is we have to be a better savvy consumer of the media. We have to know that when we’re listening to stories and they sound ridiculous, they may very well be ridiculous. When you hear the story about the guy who’s driving the RV and he puts it in cruise control and he goes back and makes a cup of coffee, and then he gets into an accident and he wants to make a claim against the manufacturer of the RV. If it sounds crazy, it probably didn’t happen. It’s probably propaganda that’s been intended to convince you of something that’s false to sway your opinion. The second story line in the film is about what are called Caps on Damages. Which are these one size fits all amounts of money that legislators cap or put a maximum amount that people can get if they wind up having a horrible thing happen to them and they want to bring a case into the court system. Well what’s so ridiculous about these caps, is that the people who are putting these one size fits all caps, they’ve never seen the person who’s been injured. They don’t know what the extent of the negligence was or what happened to the person. They don’t know how long this person’s going to be suffering and yet they put tis maximum amount of money on. In California for example, for a medical malpractice case, the cap is $250,000 for pain and suffering. It’s been that since about 1970 something, mid 70s. It’s never been increased, and what that means for consumers is that it’s very difficult to bring a case for a medical malpractice in California. Jason Hartman: Well I’ll tell you something about that. I have a comment. I was talking to an attorney about that who specializes in legal malpractice. And he was basically talking about medical malpractice, and he’s based in California, and how there’s basically no medical malpractice business anymore. There aren’t any attorneys that want to do it because there’s just nothing in it for them. So consumers, they may not be able to even bring a case because there’s no attorneys out there that want to do them because they’ve taken all the money out of it. Susan Saladoff: But, I want to just reframe what you’re saying. Because you’re saying that the lawyers aren’t doing it because they’re not making money and what I would say to you is that the lawyers aren’t doing it because the risk/benefit analysis is so lopsided. These cases are a fortune to bring. They cost hundreds of thousands of dollars to bring and they take years to resolve if they ever get resolved at all. So that it’s not that lawyers won’t be making money, they will be losing money. They won’t be able to bring them because it will cost them more to bring the case than they could ever potentially recover anything. And that’s recover for the plaintiff even, not just recover for themselves. I know that people want to believe that lawyers are only doing this because they want to make so much money, look. Nobody ever criticizes other business people for wanting to make money. Jason Hartman: Well listen, I don’t either. Lawyers have the right to make money too, as long as it’s ethical and legitimate in the way that they do it. Susan Saladoff: I can only speak for myself. I went into the business, I was a medical malpractice lawyer for many, many years. And I did it because I actually wanted to right wrongs. I actually believed that there were people that deserved, for no fault of their own, wound up having these horrendous things happen to them, and then all they wanted was to live a normal, comfortable life even after what happened to them. Look what happened to Colin Gourley in the film. This young boy who’s now 17 years old, he’s going to live the rest of his life with this horrendous brain injury. And what did he do? Nothing, except he was a victim of medical malpractice. Jason Hartman: And do you want to just give a synopsis of that case for a moment? Susan Saladoff: Sure. So Colin and his brother Conner were identical twin boys. And during their birth process, their mother had a condition called the twin to twin transfusion syndrome where one baby starts getting everything and the other baby starts getting nothing. And it happens late in the pregnancy, so the babies are coming along fine, and then the mother notices that the babies aren’t moving as much. So she goes to the doctor and she starts complaining and for a variety of reasons, the doctor did not deliver the babies timely, which is what the doctor should have done. But by the time the doctor said yes, you have to get these babies out, the standard of care required that the babies be delivered in a very short period of time. And there was a very long delay, and as a result, Colin was not getting enough oxygen and he suffered cerebral palsy. The family brought a case against the doctor in Nebraska where they live, and they won the case. The jury found for the plaintiffs that the doctor was negligent and they awarded 5.65 million dollars to basically take care of Colin for the rest of his life. In Nebraska there is a one size fits all cap on not just pain and suffering but on all damages, medical, bills, wage loss, pain and suffering, everything. And that cap at the time was 1.25 million dollars, which means that even though the jury found that this child needed this care for the rest of his life, the family was only going to get a maximum of 1.25 million which of course by the time you take out attorney’s fees, and medical bills, and other things that needed to be paid, Colin wound up with just a few hundred thousand dollars. Now it’s still going to cost 5.65 million dollars for this child to have what he needs for the rest of his life, but instead of the wrongdoer, the doctor and the insurance company paying, you and I have to pay. Jason Hartman: The tax payer. It falls on the tax payer. Susan Saladoff: Exactly. And so then there were two other story lines in the film. The third one is about Judicial Elections. Which is how we are essentially, well not just essentially, we are electing our judges in most states now. And when you elect judges, that means they have to run for office and they have to raise money. And when they do that, they can become beholden to whoever it is that gives them the most amount of money. And again, these can be done through front groups because of the citizens united case. And so we document in the film, the true life story of Oliver Diaz, who was fictionalized, his story was fictionalized in the John Grisham book The Appeal. But essentially, Oliver Diaz, who was a Mississippi state supreme court justice, was targeted for defeat by the US Chamber of Commerce because he wasn’t pro corporate enough. And they put millions of dollars into his opponent’s campaign, put out these false television ads that we let criminals out of the court system, and these crazy ads that were not true, and eventually Oliver wound up winning the election regardless. And then they brought these false criminal charges against him claiming that he was bribed and that he accepted a bribe, all of which was completely false. But he wound up being off the bench for three years fighting these false charges, was eventually acquitted, but because of all of this false publicity, his reputation was tarnished and he was unable to win election again. And this is happening all over the United States. People don’t understand that the US Chamber and other corporate groups are now essentially buying our supreme courts of our states, which are the courts that decide most of the issues that are important to us at our local level. Jason Hartman: So counter intuitive really, Susan, because we think that going with the Chamber of Commerce is pro-business and good for society in a way. They build it that way, but what really happens is then it falls on government and government is just the tax payers. So like in that medical malpractice case, everybody ends up paying rather than the company itself. It’s kind of counter intuitive, isn’t it? Susan Saladoff: Well also they’ve put out this message that is very effective about personal responsibility. We all need to take personal responsibility. Oh by the way, I didn’t mention this, it’s a really important fact. Mrs. Liebeck was found 20% at fault for spilling the coffee on herself, Stella, but the company was found 80% at fault because they had paid out over 700 other claims of people who had been burned by coffee and yet they refused to lower the temperature. So corporations love to talk about personal responsibility but they never talk about corporate responsibility. They never take responsibility for themselves, they just want to blame the victim. Jason Hartman: Just out of curiosity though, why wouldn’t McDonalds lower the temperature of the coffee? What was in it for them to have the coffee so hot? Susan Saladoff: I don’t know the real answer because McDonalds at the time of the trial, they put on the Juan Valdez of coffee, the expert on coffee, that says that coffee tastes the best when it is served at that temperature. Which is of course ridiculous because you can’t drink it. So my guess, and what I believe is probably true is that it has to be an economic issue. And many people have speculated that they can use either inferior beans, or that the coffee will last longer in the pot and they won’t have to make as much coffee if they keep it at that temperature. But there are many, many people who have guessed about this. I believe that it has to be an economic issue but I don’t know the exact reason. Jason Hartman: Interesting. Well what else do you want people to know? Of course, watch the film. The website is HotCoffeeTheMovie.com, and of course you can search it on Google. What else do you want people to know though? Susan Saladoff: Well What I want people to do is to watch the film before, show the film, get it out to as many people as they know, before the next election. I want people to understand what their rights are. because it’s so funny, everybody knows the first amendment and everybody knows the second amendment of the constitution. But we actually have a seventh amendment of the constitution, which is our right to trial by jury. It was one of the fundamental rights that our founding fathers believed was important for us. And so, we are being asked to give up our seventh amendment rights to a trial by jury in almost every election cycle. And it hasn’t started coming up in the debates but it will start coming up in the debates as soon as they start debating president Obama, the republicans, this issue of tort reform. And what I really want, is I want people to understand what that really means for them. Because when people understand what that really means for them, I think that they would be unlikely to say yes I would be for tort reform, because it means that they are voting against their own self-interest. They’re giving up their own constitutional rights to access the court system which is the only place where we as average citizens can hold wrongdoers accountable. And I also want people, when they sit in a jury box, when they go and get called for jury duty, if you do every get called for jury duty, serve. It is an amazing experience. You will learn so much from doing that. But when they do sit in a jury box, be a fair juror. Give both sides a fair opportunity to be heard. Because most people at this point think that if they give a big verdict, that somehow it’s coming out of their own pocketbooks. Or they’re being fed this information that if they give a verdict in a medical malpractice case that doctors are stopping practicing medicine and all these other things. These are just false information. The truth is that even in those states where they’ve enacted tort reform, which is in many of the states, health care costs continue to go up, doctor’s insurance rates do not go down, the people who put out this information put it out to try to convince people of something that’s inaccurate so that again, they can make money. And I just want people to understand this and to learn what their rights are and get this information out to as many people as possible. Jason Hartman: One more question before you go, Susan. You talk in the film about a group entitled, and it’s a group actually which I have supported, because on the face of it, it sounded good. And that is Citizens Against Lawsuit Abuse. Who are they funded by, what’s their deal? Susan Saladoff: So this is very interesting. Citizens Against Lawsuit Abuse was a name that was made up by a public relations firm in Washington DC called APCO. And I actually met the woman that came up with the idea. She worked for APCO and she said that was my idea. And I said, but what about those people who supposedly started this group? She goes, oh no we hired those people. So this is a group that supposedly is made up of these citizens that are outraged by all these lawsuits, but in fact it’s a campaign that was started out of Washington DC and then repeated over and over again in every state to again, bring…and it’s essentially funded by the Tabaco industry, and by large corporations. They put out this false information to do what I’ve been talking about during this whole interview, which is true distort the truth about the civil justice system so that people would think that the system is broken and be able to give up their own rights. So there are very few citizens that are members of citizens against lawsuit abuse. It was started from the top. They call it an Astroturf group. It’s not Grassroots; it started from the top down. Jason Hartman: It’s fake. That’s really interesting because when I say I’ve supported it, I’ve been to a couple of their luncheons. A few people I know invited me to some of their luncheons and I went. I heard what they had to say; it sounded good on its surface, but you just really never know what’s behind all of this stuff. These names, they’re deceiving. Susan Saladoff: Can I give your listeners a way of getting the film if they haven’t seen it? Susan Saladoff: So, it’s been on HBO a lot and so it actually just came off of HBO this week, but if you have HBO you can download HBO Go onto your computers and you can stream it on HBO Go. It’s also available on Netflix but not streaming, you can get the DVD from Netflix. And then you can buy a copy of it either by going to our website, which is HotCoffeeTheMovie.com or you can go to Amazon, its available there. And so get a copy of the film, watch it, have a house party. And then I’m encouraging people to do what I call the pay it forward house party. Have a house party and then we someone at the house party gets excited or gets outraged, give them the film and say you take the film and have a house party with your friends, and then that person passes the film along. And so, just continue to get the film out to as many people as possible. We also have a Facebook fan page where we tell people where we are. I’m traveling all over the country doing screenings in many, many cities, so if you want to know where I am and where the movie is, if you go to Facebook.com/HotCoffeeTheMovie and you Like us, you’ll be able to follow us. And also if you go to our website, we have a ton of information on our website about how you can take action, what you can do to pass the information about the movie along, interviews with me, I was on the Colbert Report, and my interview is on the home page. And also get the film into schools, into high schools and colleges and law schools. Get a copy to your legislators; get a copy to your judges. This information, and I’m not just saying this because I want to sell DVDs, it’s information that most people don’t know about and they really need to know about because it’s fundamental to their rights. Jason Hartman: There’s definitely another side to this story about Stella, folks. Check out the film. Susan, thank you so much for joining us today, appreciate it. Susan Saladoff: Thanks Jason. I appreciate the time.